Electric bikes have become so much less of a niche hobbyist possession. They are gaining in popularity every day owing to their positive contribution to the environment and there sleek and classy designs. They are constantly being updated with improved technology. They are a great option for daily commuting and specialist riding. Not only this but so many are built with great safety features that they are becoming even safer to use than driving a car. Below is a list of ten products that have been selected for review. 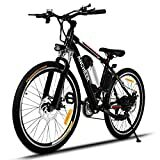 Read on for an example of the selection of electric bikes available for purchase at the moment. NAKTO Shimano Electric Bike is a cleverly designed, subtle electric bike that is multi-purpose and multi-functioning. The bicycle allows up to nearly 30 miles of usage from one single charge owing to its strong and powerful lithium battery. It also reaches speeds of up to around 25 miles an hour, which is great for an electric bike. You can adjust the seat as and how you need to so that it can be shared with your family or friends and you can adapt it quickly and easily. 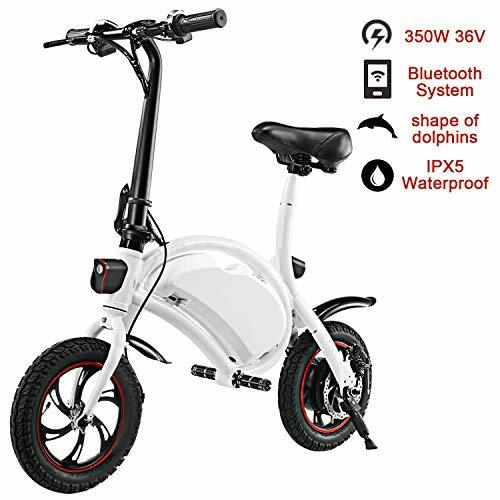 Manufacturer’s instructions are included with the bike, and they are clear and concise, and if your question is not there, then customer service is just a phone call away. It has a safe brakes system installed on the bike, front and back which will keep your mind at ease while in use. Why We Liked It – This bike is a great option for somebody looking for a reliable and durable electric bike. It can be used mobile or standing still, in the day time but also at night time owing to the LED headlight feature on the bike. 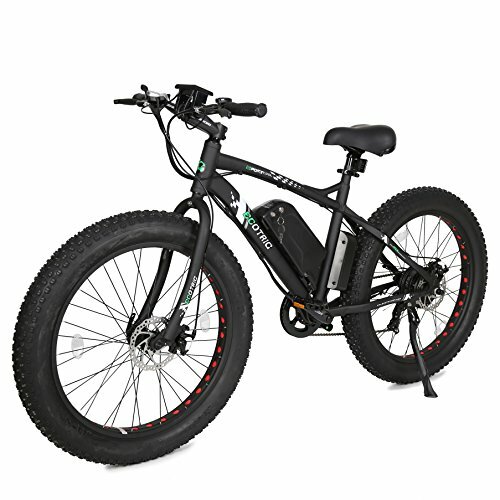 The ECOTRIC Fat Tire electric bike is strong and dynamic. It is designed for and therefore equipped to deal with any number of different terrains including the beach and excellent on dirt roads also. Therefore, you can take the bike with you anywhere with ease and with the comfort of knowing it won’t let you down as it goes. The tires are thick and have a great tread and grip built into them, which makes the bike that much more durable than its competitors. It has a great battery life, a strong motor, and top speeds. Not only this but it can support larger weights of up to 260 lbs. and not be slowed down in any capacity. You can adjust the seat as and how you like or need, and the handlebar is fully ergonomic, which means it is built for comfort and can become bespoke to you quite quickly. Why We Liked It – This bike is strong and powerful and can sustain and support larger weights as well. It can travel on a variety of different terrains which makes it versatile and interesting. Tomasar Power electric bike is a modest yet powerful addition to the electric bike market. It has a great battery life which provides a good range (up to 25 KM). It is made from a durable aluminum alloy frame alongside other durable materials such as carbon steel. Tomasar has also included front and rear brakes for extra safety and peace of mind while using their electric bike. The back and front wheels on the bike are built with strong traction and grip and of top quality material, so you know that they are safe, reliable and durable. It has seven different speed settings which are easy to maneuver around and are also explained in the detailed manufacturer’s guidebook provided with the bike. Why We Liked It – This bike is slightly cheaper than others on the list, but that does not detract from the value of the product overall. It has a great battery life and strong motor as well alongside coming in a variety of different patterns and designs. This is a compact bike that can be assembled and reassembled quickly and easily, though it might take a few attempts to practice. It has a range when fully charged of just under 30 miles, which is at the higher end of standard when it comes to electric bikes. It has quite a powerful motor at 250W which only adds to how smooth the ride is when using this bike. The 21 gear system means that you can travel vertically upwards with ease and without having to strain yourself too hard thanks to the supportive gears on the bike. The battery takes around three hours to be charged completely and should be done after every ride just to be on the safe side. Of course, that is the charge time from a flat battery so it will take less after half a journey. 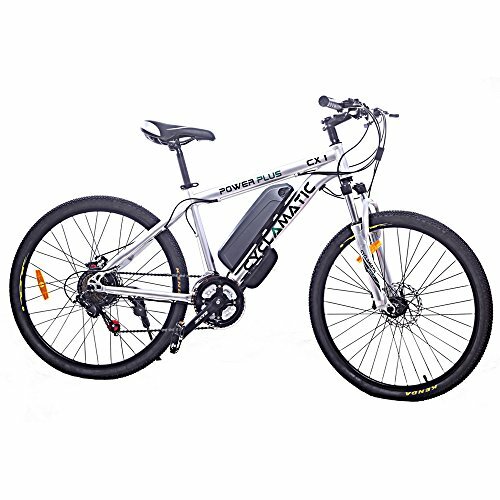 You can also use the bike as a normal pedal bike without all the electric features, the battery is fully detachable. Why We Like it – This is a versatile bike offering a large motor, large range and large capacity to function in all weathers and a variety of different terrains. 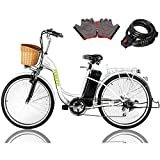 It is a good option if you are looking for a quick and easy, no fuss no frills electric bike. This is another great electric bike from NAKTO, creators of many great electric bikes. This one is more specifically designed with mountain bikers in mind, as suggested in the title. It is made from strong, waterproof aluminum materials and has extra suspension to allow for more control when riding on rough, mountain terrain. There is a one year warranty, but it only covers some of the parts of the bike so you might want to consider still taking out your own insurance. The bike works as a pedal bike, an electric bike and a combination of both it is up to you and how you assemble it. The tires are strong and durable and built for rougher terrain and the charge time takes around four hours. Why We Like it – This is a versatile bike with a great set of features. It is well designed and stylish providing a top quality, safe ride. 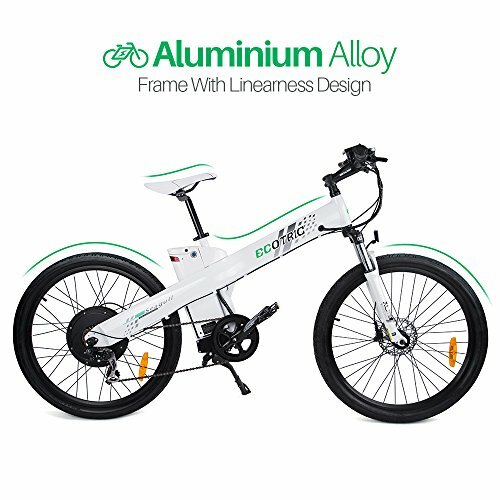 This is a lightweight and foldable electric bike with a sturdy design that is intended to be fashionable and appeal to the youth generation. It includes a Bluetooth system and is completely waterproof as well. The fact that it is foldable means that you can store it much more easily than other electric bikes which would require more secure storage in a bigger space. It only features a rear brake, so may not be suitable for high-speed riding. The battery takes around three hours to charge which will give you a shorter range, under 20 miles, but the motor is not as powerful as alternative electric bikes. It even comes with a one year warranty, which is great in case any of the parts break as you would not have to splash the cash on replacing them and subsequently paying for repairs. Why We Like it – It is foldable and easily storable and comes with great reviews and the added feature of Bluetooth built into the machine itself. CIVI have a wide range of bikes, and this one is one of the best options available. It is a very powerful bike with a large motor and a strong battery. It has high powered brakes for extra safety that will stop in any weather condition safely and soundly owing to the combination of safety, super grip tires. There is even a LED front headlight so that you can use the electric bike for night time riding legally and safely. There is a charging time of around five hours, which will get you just under 30 miles of riding time, at full speed. Therefore, you might get a bit more if you are just pottering around with the electric bike. The bike even comes in a variety of colors and patterns. Why We Like it – The CIVI predator comes with a one year warranty, something that seems to be lacking with other electric bikes out there. This means for the price of the bike, you get extra peace of mind if a part breaks or needs replacing. 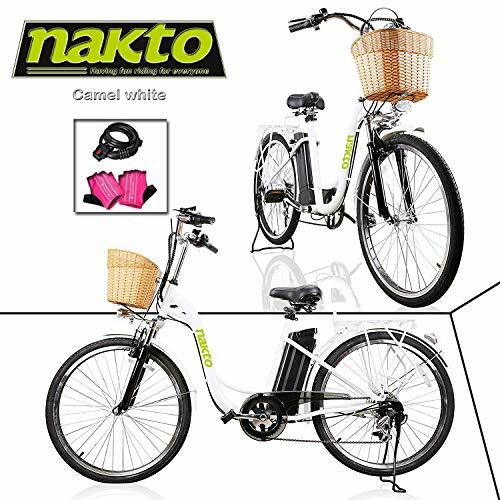 This is another great electric bike from NAKTO. It has a big battery, not the biggest on the list, but big enough to give you a good long run time from a single charge. In fact, you can keep going for up to 26 miles on one single charge, which if you think about it is actually quite a long distance. As with the majority of electric bikes out there, you can adjust the seat to suit you as and when you need to, and the handlebars are ergonomically designed for your optimum comfort. It has safety brakes at the front and rear of the bike, and it has a six-speed system installed as standard. This is easily adjusted intuitively, and if you are needing further clarity, the concise and detailed manufacturer’s guide will provide all of the answers that you need. Why We Like it – This bike is clever and smooth. It doesn’t take a long time to charge the battery up to its full capacity and has a powerful motor that can keep the bike going at rapid speeds for the duration of your journey. This is one of the more expensive bikes on the list to be reviewed, at around $1,300 to a varying degree. However, it does have more power behind it to justify such a price tag. It has a big battery (48 V Lithium) and can actually travel at a maximum speed of 25 MPH. This speed can be maintained even when carrying the top weight of this bike’s capacity – 260 lbs. It has a smart LED display panel displaying your speed as you go so you can keep track of it in an easy manner. The bike even comes with cruise control so that you can set the electric bike at which speed you would like to travel at and then let the bike do the rest of the work. The bike comes with the usual adjustable seat and ergonomic handlebars to add to ease of use and comfort. Why We Like it – This bike has great reviews and is powerful, well designed and safety focused. The tires are built to last and are also anti-slip with high grip features as well. 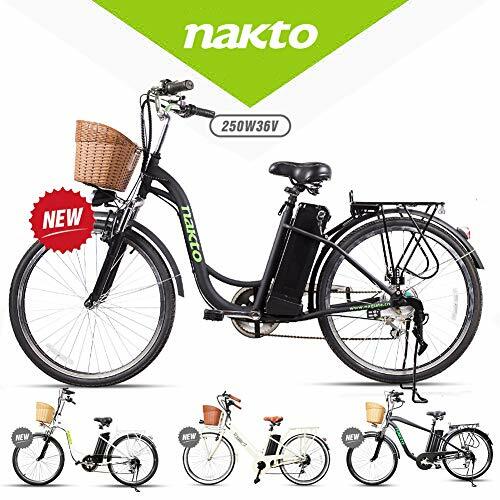 The NAKTO Speed-G30 electric bike is a great product that ticks all the boxes you want your electric bike to tick. It is affordable and made from high quality, strong materials such as carbon steel and aluminum. Therefore, you know it is a product that is built to last and is made with strength and sustainability in mind. 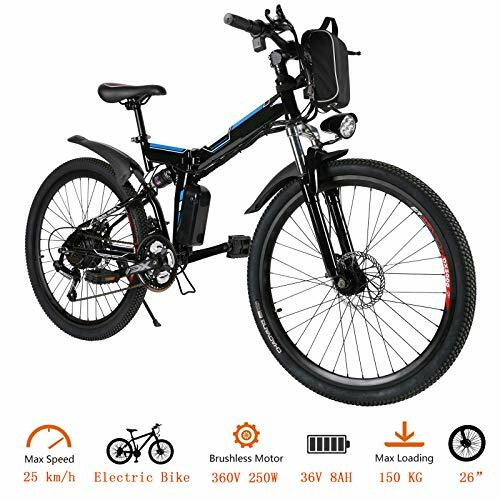 It has a strong battery and consequently a great range of use; in fact, you can get up to 35 miles out of the bike, after having charged it fully, from one charge. That is a great distance! It can reach up to speeds of 25 miles an hour, which is quite fast considering how fast you can travel on an average push bike. It comes with two modes of use, static or mobile so it can be used for a variety of different types of exercise. Why We Like it – This is another affordable bike that comes with great features such as front and rear safety brakes at a much lower price than its competitors, for the same value and quality product. There are so many more great electric bike products out there, but above are the top ten that have been selected for review and to demonstrate a range of features and attributes that you may not have considered you would be looking for. The question remains, what are you looking for when you are buying an electric bike? Consider the following criteria discussed below to give you a little bit more of a clearer picture. a) How long does it take to charge? You don’t want to have to wait around for a full day if you run the battery flat. Average charging time would be around three hours to get a full charge. b) What size is the battery? This is important as it dictates how many miles you can get from one single charge. If you are using your bike for your daily commute, this becomes important quickly. c) Is the battery detachable? This is a matter of security as well as a matter of convenience. You want to make sure the battery can’t be stolen and that if needed, you can remove it at will. d) Is the battery protected for all weather conditions? If the answer is no, then this may not be the bike for daily use. The battery should be in a protective casing to keep it safe from all types of weather. The size of the motor will determine how powerful your electric bike is. It also determines what speed the bike can go at, what weight it can take and how durable the bike will be in the long run. 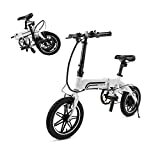 All electric bikes come with a variety of different motor sizes that are usually powerful enough to be able to support an average sized adult. However, this information is definitely worth checking out pre-purchase- just in case! Ask yourself: How far do I need to travel on my electric bike? If the answer is: Just a few miles, then it doesn’t really matter. However, if you are intending to use your bike on a daily basis, then the range becomes a little bit more relevant. Perhaps you may be using your bike for your daily commute to work and back, or maybe just on adventure days. Regardless, you need to know exactly how many miles you can get out of a charge so that you don’t end up struggling unnecessarily and behind schedule. Most mainstream electric bikes will provide a range of around 20 miles, often more, from one charge. How fast do you need your bike to go? An average speed that an electric bike is capable of is around 18 MPH. This is quite fast and will definitely get you where you need to a lot faster than the average pedal bike or by walking. However, there are some bikes that can go up to 28-30 MPH. These speeds may be for the more extreme hobbyists out there. Of course, this usually is dependent on the physics in the equation. What weight is the person riding and what height is the person riding will dictate the top speed that the electric bike is capable of. With that in mind, the majority of electric bikes can sustain at top speed capacity of around 260 lbs. Brakes are important. Brakes are the key safety feature of any vehicle, and the electric bike is no exception to this. If you are using your bike for top speeds, mountain biking or riding it around traffic, you need to be diligent that the brakes provided on the bike are fit for purpose. The majority of electric bikes will be fitted and made with front and rear brakes, which provide extra safety and extra stopping power. However, this is not always the case and is definitely something that needs researching before making any purchase. The brakes are the last thing you need to be worrying about while riding! Is this bike multipurpose? I.E., Does the bike function as an electric bike AND a push bike if necessary? This is true of most electric bikes, but not all. It is worth considering in case something goes wrong with the technology, and you need to continue with your journey. Lots of electric bikes can be adapted into pedal bikes with ease. Does the electric bike come with a warranty? Hopefully, the answer is a big fat YES. Otherwise, you may end up spending a lot more money than you had originally planned. A good warranty should be at least a year and cover all the important parts that may fail. If it doesn’t, you may need to look for additional insurance. Electric bikes are undeniably much better for the environment than doing your daily commute by car or other modes of heavier transport. In fact, up to 26 lbs. of CO2 is prevented when an electric bike is used in place of a car over 500 miles. Just imagine how much greener the planet would be! Make sure that the bike you pick is equipped to deal with and ride on the terrain that you are going to use it on. 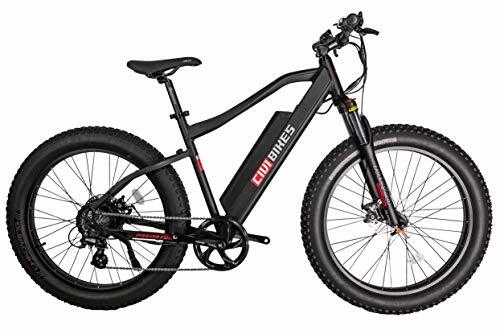 If you are a mountain biker, then you need to be finding a mountain bike specific electric bike that is built for this purpose. Otherwise, you may run into trouble along the way and end up injuring yourself and your bike!